Today’s activity is so simple to set up, inspires creativity and can be used for a variety of lessons, holidays, etc. I love doing the christmas tree and the Valentine’s heart sticky wall. It is one of our favorite activities and are generally pretty mess-free! 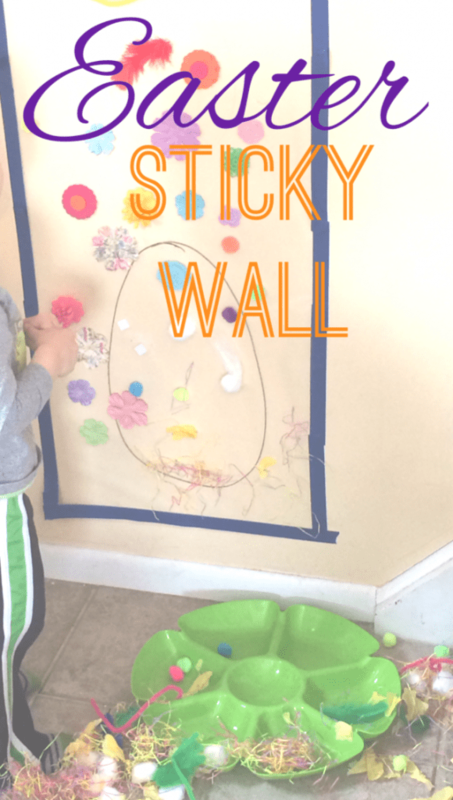 This project includes an Easter themed sticky wall, fun and seasonal! The set-up is very simple and open-ended; all you need is contact paper, painter’s tape and any little accessories you have around your house! Because I wanted to stick with an Easter theme (and Easter is so soon I need to pack all of these activities in!) I chose ‘cotton tails’, ‘chick feathers’, colored pom-pons, pipe cleaners, easter grass, yellow tissue paper, and felt flowers. I like to theme my sticky walls but you can definitely just find whatever you have around and let your child stick it up on the wall. That is really what they enjoy about doing this activity anyway! Once you have everything ready, it’s time to put your paper on the wall. Cut a large piece, or a shape, out of your contact paper, leaving the backing on to begin with. You want to place the paper on the wall sticky side out. Work in sections, if you peel the backing off all at once it starts to curl up and stick together (and believe me it is frustrating!). As you peel sections down, tape the edges with the painter’s tape. I had a helper so it made the process even easier! Continue until you have the whole piece of contact paper attached to the wall. Then you let your child explore and create! I drew an egg (and a bunny which you can’t really see) to give M a little bit of inspiration. A (9 months) LOVED playing with all of the items and especially loved the texture of the easter grass. I was so proud of her she didn’t even try to eat any of it!! I think she is beginning to get the idea of these projects…and that it’s not really a mealtime. Once we were done with the sticky wall…we decided to put it on the floor and explore a little further. M and I found it quite entertaining to put A on the sticky paper and watch her try to get up, she didn’t seem to mind! It inspired us to put a brand new piece of contact paper on the floor with duct tape and play on it. The kids loved it so much I’m afraid it might become a permanent fixture in our living room 🙂 This would be a great sensory project in and of itself to do with babies! 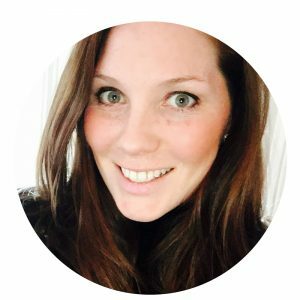 Follow me on Pinterest for more ideas like this!